Gravel bike is a broad term encompasses a range of different bike styles. These kinds of bicycle have been around at least a couple of decades now and they existed long before people started using terms like gravel bike, adventure bike and all-road bike. While the term gravel bike obviously comes from the US gravel racing scene, the actual bikes themselves have multiple origins but all have a strong lineage from the custom builders who built cyclocross frames that accepted tyres wider than the 35mm (now 33cm) maximum width stipulated by UCI sanctioned racing. So whilst the Vulture falls into the gravel bike category, it’s roots go much further back and the original drawings for the Vulture were made before the terms gravel bike and adventure bike were in common cycling parlance. 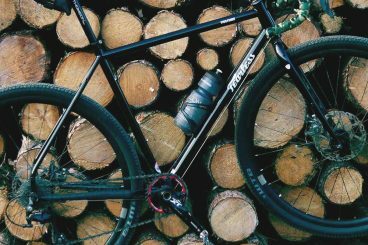 So in the broadest possible sense the Vulture is a gravel bike but at its core it’s a high quality, multi-terrain, multi-purpose bike designed around drop handlebars. 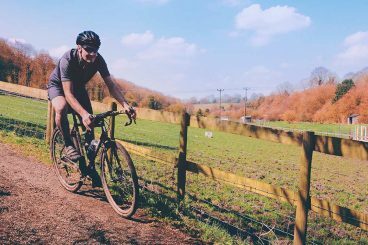 If categories are your thing and you need a frame of reference then let’s say it’s two parts gravel bike, one part adventure bike and one part cyclocross. One of the Vulture’s key design goals was to max out the performance of a steel frame whilst still keeping it affordable. By affordable we mean it’s compatible with a wide variety of components both old and new so the overall cost of building a complete bike is greatly reduced. Rather than the usual cost cutting measures of using cheaper tubing and construction, the Vulture’s frame is built using double-butted Reynolds 725(Ⓡ which is heat treated chromoly steel tubing. We use this tubing for the three main tubes to save weight over standard 4130 cro-mo pipes. Build quality was a priority so both the frame and fork are welded to a standard usually seen on frames considerably more expensive than the Vulture. We wanted the frame to be partnered with a high quality chromoly steel fork that had rack and mudguard mounts so it was ready for touring, commuting or just hauling stuff around. Another prerequisite was compatibility with the weight saving virtues of contemporary carbon gravel bike and fat tyre cyclocross forks. To enable this, the frame was equipped with a tapered head tube and the supplied 404 fork was spec’d with a longer than standard A/C length allowing a wide range of carbon forks to be fitted without changing the bike’s geometry. Measuring frame fit using reach makes sense on dedicated road racing frames which have relatively steep seat tube angles across their size range. Steep seat angles mean variations in saddle height have less effect on the distance between the saddle and bars. This makes reach a reasonable approximation of how well a road racing bike will fit. However gravel bikes need to balance larger tyre clearances and reducing toe overlap against rider compartment and wheelbase. This means larger variations in seat tube angle across frame sizes to make the rider compartment long enough for a given frame size without lengthening the wheelbase too much and thus keeping the handling dialled. As reach doesn’t measure anything behind the stack line running vertically from the bottom bracket, you can’t really judge how well a gravel bike will fit using reach. So when calculating the correct size Vulture frame for you, the two key metrics are top tube length and if you’re short of leg, standover height. When considering the Vulture’s stack measurement remember to add 15mm to accommodate an external top headset cup. Adding this when comparing frames with a 44mm headtube and internal top cup will give a better understanding of how tall the front end will be. Which carbon forks fit the Vulture? Most if not all tapered carbon CX and gravel bike forks fit. Recommended axle to crown length is around 395mm. You can fit forks around 400mm long but they’ll slacken the head angle by around 1 degree- not necessarily a bad thing, especially if you’re mostly riding off-road in steep terrain. 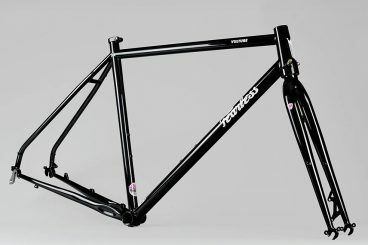 Most manufacturers don’t publish the weight of their steel frames but we decided to be honest and publish ours. A lot of the decisions we made whist designing the Vulture were about optimising weight and rear triangle lateral stiffness (no integrated dropout/brake mount, tapered headtube, heat treated main tubes) so we know our frames are highly competitive in this regard- there’s nothing to hide. 404 Fork- 1.15 kgs with an uncut 300mm steerer. Frame weight includes BB cable guide and derailleur hanger. Weights are +/- 5 grams accuracy. Typical fork weight when cut to length is around the 950g mark depending on frame size/head tube length. Which brakes should I use? A couple of reasons. Firstly, to keep the Vulture lightweight. Post type mounts on steel forks are large cast or machined bits of steel with the lower mount protruding 5cm or so from the fork leg. Using an aluminium adaptor to bridge the distance between the fork blade and the calliper instead of a steel post saves weight. Secondly, if you’re intending to use the Vulture primarily off-road riding, loaded touring or are using cable disc brakes (or maybe all of these things) you’ll want to use 180mm/160mm front/rear rotors for increased braking performance. This will mean you’ll be fitting the callipers to the frame with adaptors anyway, no matter what style of brake mount the frame and fork has. The recent Flat Mount standard doesn’t have any performance advantages and was mainly an aesthetic consideration to get roadies to upgrade to discs. There’s quite a few pitfalls for flat mounts on steel frames including extra weight. Flat Mount also means all the braking force is applied directly to the chainstay rather than spread across both the seat stay and chainstay like I.S/Post Mount. This means bigger chainstays or a heavy unified dropout/brake mount is required. Also note that Flat Mount max rotor size is 160mm. Other brands of adaptor are ok too- the above are listed as we’ve used them and can testify they are well made and have the correct clearance for a wide variety of callipers. Which headsets fit the Vulture? The best way to find the correct headset is to search using the S.H.I.S code (Standard Headset Identification System). ‘ZS’ stands for Zero Stack, ’EC’ stands for External Cup. Will you sell a carbon fork for the Vulture? No plans currently. We really like the utility of chromoly steel forks and the 404 fork is a really great chromoly fork. We sell the Vulture as a frameset so maximum compatibility with both old and new components is a major consideration. Customers are building up frames using a mix of legacy parts and new stuff, often using one of the many wheelsets out there that are compatible with both 9mm QR and 12mm thru axle. The 12mm through axle format was originally designed for full suspension mountain bikes where the two sides of the rear swing arm have a tendency to move independently under hard pedalling and cornering. 12mm thru axles offer little benefit to frames like the Vulture with an already laterally stiff rear triangle. This logic also applies to the fork- the 404, tracks accurately and the dropout’s tolerances are tight so there is zero wheel movement under hard braking. If you intend to fit a carbon fork and your planning to by new wheels to go with your frame, we recommend getting an MTB or gravel/cx disc wheelset that’s compatible with both 12mm thru and 9mm QR as this will give you a wider range of forks to choose from. Why is the Vulture’s seat clamp the wrong way round? On frames with conventional rear facing seat tube slots, dirt and water flying up from the back wheel has a tendency to get inside the seat tube. This can damage the surface of the seat post or even worse, cause the seatpost to seize inside the frame. Having the seat collar facing forward and away from the line of the rear wheel helps alleviate this issue.